Posted on May 29, 2014	by Katy K.
My love is always on the look-out for new superhero-themed books to listen to, and this is one that he bought and loved so much that he burned it onto to CD for me to listen to in my car, and hounded me until I did. Now that I have, I’ve been seeing Seanan McGuire pop up all sorts of places, like writing the introduction for Speculative Fiction 2013, edited by the Book Smugglers. 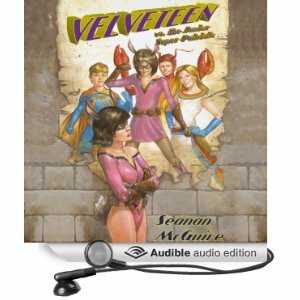 Velveteen vs. the Junior Super Patriots by Seanan McGuire. Read by Allison McLemore. Audible Studios, 2013. Print ISiFic Press, 2012. 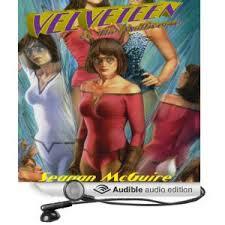 Velma Martinez, aka Velveteen, was bought by the Super Patriots, Inc., as a young teen. Her parents were happy to take the large payout with the promise of more to come and freedom from the difficulty of raising a super-powered child. She grew up a member of the Junior Super Patriots, West Coast Division, following strict rules, and given as much training in maintaining a marketable media presence as using her superpowers. She bonded closely with her teammates: Action Dude (your regular flight and super-strength guy), Sparkle Bright (photon manipulator), and the Claw (half lobster due to his father’s genetic experimentation.) Velveteen herself has the power to animate stuffed animals and dolls – hence the gag-worthy bunny ears and tail Marketing forces her to wear. And then the team fell apart. Instead of signing a new contract when she turned 18, Velma quit the superhero life, trying to make it on her own with a series of minimum wage jobs. Now in her 20s, she’s got a car on her last legs and a desperate need to make it from California to Oregon, where the superhero laws will allow her to take shelter from the long arm of the Super Patriots, Inc. Marketing Department. On her way there, she’ll face a former team mate turned villain, a barista determined to use coffee and free wifi to open the world up to a realm of eternal shadow, and the new members of the Junior Super Patriots, West Coast Division. It sounds hilarious, and it is. These linked short stories (available in print and free on Seanan McGuire’s website) are filled with quirky yet believable characters and Velma’s struggles to live a normal life despite her upbringing and superpowers. But it also has a lot to say about how we treat our child heroes, using them up and spitting them out again when they fail to stay the innocent stars we want them to be, despite the harsh grown-up world we put them into. My love wishes the language were cleaner, so we could share it with our kids – there is a lot of foul language, mild violence, and no real sexual content, so I’d say it’s good for interested teens and up. Allison McLemore does a wonderful job of bringing the characters to life, from Action Dude’s all-American hero voice to Velma’s world-weary tones. I’m just sorry that the audio is only available from Audible, as I’d like to see it available from the library as well. Velveteen vs. the Multiverse by Seanan McGuire. Read by Allison McLemore. Audible Studios, 2013. Print ISiFic Press, 2013. Now ensconced as Portland’s official superhero, Velma/Velveteen has some fragile success and a whole lot of new challenges, from figuring out when it’s time to exchange real names with her new superhero boyfriend to trying out the alternate versions of her life in the Snow Queen’s mirrors. In one of them, she meets a displaced steampunk heroine, Victory Anna. The stakes are higher and everything is more intense as it might finally be time for Velveteen to take on the Marketing Department directly. It’s even better than the first volume, which is saying a lot. We’ll definitely be looking into more Seanan McGuire – I just saw that her latest, Sparrow Hill Road is on the hold shelf waiting for me to pick it up. This entry was posted in Books and tagged adult fantasy, audiobooks, diversity, superheroes. Bookmark the permalink. 5 Responses to Velveteen vs.